Any time a track gets moved, added, or deleted, there is a chance that your libraries (as maintained by iTunes) may be out of sync with what is actually in the library. For example, if you move a folder full of songs into a library outside of iTunes or if you manually delete some tracks from your music library folder outside of iTunes, iTunes will not know about these changes and neither will SuperSync. This causes 'orphan tracks'. If you try to play or view a track that is not there/orphaned, the track will be marked as "Not there" and it won't be played. 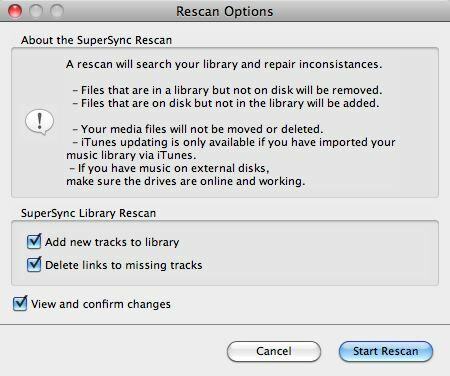 SuperSync's Rescan Local Library looks for these changes and updates your Local Library (and iTunes if your Local Library is set to iTunes) with the changes. To use this feature, go to SuperSync's LOCAL menu and select the Rescan Local Library command. This will open the Rescan Options window. Set the 'Add New Tracks To Library', 'Delete Links To Missing Tracks', and 'View and Confirm Changes' checkboxes and then click the the Start Rescan button. Rescanning a Local Library will take some time depending in the size of your library. Note: We recommend that you enable/check the 'View and Confirm Changes' check box the first time you use this feature.